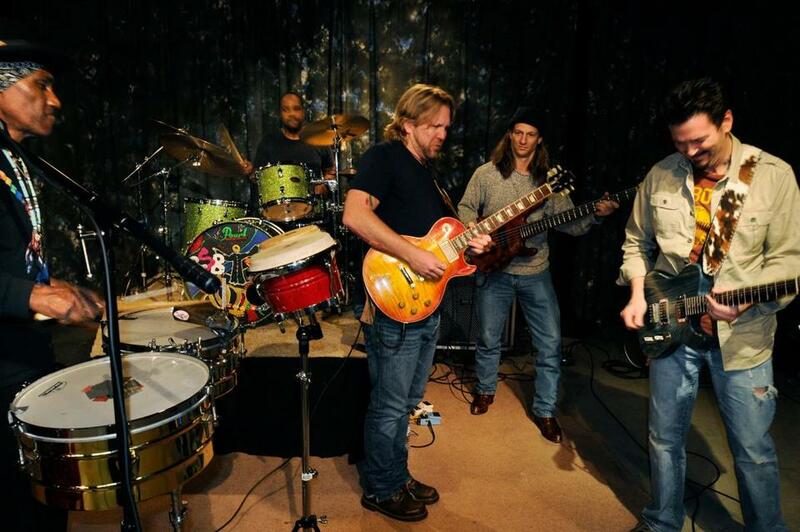 Royal Southern Brotherhood — (from left) Cyril Neville, Yonrico Scott, Devon Allman, Charlie Wooton, and Mike Zito — rehearsing recently in Palmer. Royal Southern Brotherhood is neither brilliant turn nor crazy risk for the five musicians involved - it’s both. Each member of the Brotherhood - Devon Allman, Mike Zito, Cyril Neville, Charlie Wooton, and Yonrico Scott - had a perfectly fine career chugging along before taking on this project. The ensemble is creating music that is simultaneously progressive and traditional - rock, blues, and funk flow freely - yet sounds distinct from their individual repertoires, so all involved are taking a chance. During a rehearsal break earlier this week, Allman was asked if he thought this was really such a good time to launch a band like this; after all, isn’t this the era of dubstep, DJs, and divas? Royal Southern Brotherhood is about as real as it gets. Neville, 63, is the group’s elder statesmen, bringing with him the soulful experience of singing and playing percussion in the Meters, Neville Brothers, and more recently with Galactic and Tribe 13. Drummer Scott anchored the rhythm section in the Derek Trucks Band before Trucks put that group on hiatus to form his new band with wife Susan Tedeschi. Bassist Wooton juggles three different bands around his Louisiana home base, and Scott recently started collaborating with Wooton. Allman found his footing as the singer and guitarist in the band Honeytribe. Zito likewise did the same in his own namesake blues-rock band (and both guys launched their bands from St. Louis, where they enjoyed a friendly local rivalry, though did work together in 1999 managing a Guitar Center store). Royal Southern Brotherhood kicks off its first tour this week which includes a show Sunday at the Bull Run in Shirley. To prep, the players set up shop in Don Odell’s Legends Studio in Palmer. There, they gathered for the first time in two months to work through material from the album they recorded over the summer and that’s due out May 8. The band also taped a segment for the “Legends’’ TV program Odell distributes through public-access cable stations. Just as the guitarists form a unit, there is a powerful combine of rhythm with Scott helming a kit and Neville at conga and timbales. 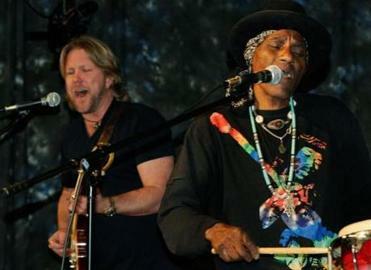 Devon Allman and Cyril Neville rehearsing in Palmer. “It’s a bass player’s dream being between these two guys,’’ Wooton says. Reuben Williams had the idea for this band. As manager to both Neville and Zito, he had a good foundation for an Arc Angels-style supergroup - a band more super for its talent than its outright celebrity. Zito mentioned Allman, and from there, Neville says, this musical gumbo had its roux. “Gumbo’s no good if you don’t have a good roux,’’ Neville jokes. The soulful singer knew he was getting into something good when both Zito and Allman transformed his lyrics into potent, swinging songs. When the rhythm section fell into place, the Brotherhood (dubbed “royal’’ for its Neville and Allman bloodlines), spent two eight-hour sessions in a New Orleans recording studio working up material. The Brotherhood also added a cover of the Grateful Dead’s “Fire on the Mountain,’’ something Neville sang with his brothers yet finds a new approach into. “When I sing that line, ‘Long distance runner, what you standing there for,’ I’m just thinking of my boy in the White House, and no matter how much he does, no matter how far he runs, he is told he is not doing enough,’’ Neville muses. “If you’re over 40, should you be starting a garage band?’’ jokes Zito about the new ground these musicians are willing to cover.